This is a "must have" for every nappy bag! Calendula Nappy Change Cream naturally protects and cares for the delicate skin in your baby's nappy area. 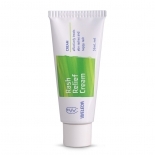 It helps prevent the development of soreness and reduces existing redness. Zinc oxide, together with pure beeswax and gentle lanolin form a protective layer on the skin, which protects against acidic moisture without drying or impairing the skin's natural functions. Extracts from calendula and organic chamomile flowers help soothe irritation. Almond and sesame oils keep the skin soft and support the healthy renewal of irritated and sensitive skin. Directions: Apply a small amount as a barrier cream to the nappy area after cleansing with Calendula Oil and/or water. 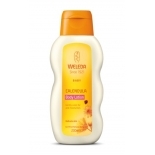 Weleda Calendula Nappy Change Cream is generally used as a preventative, for a fast acting nappy rash treatment we recommend the use of Weleda Rash Relief Cream.